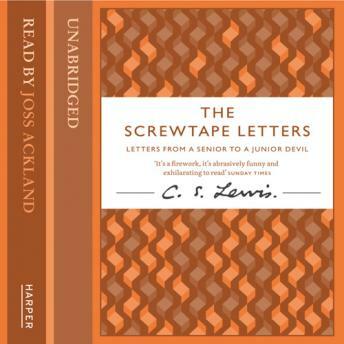 On its first appearance, The Screwtape Letters was immediately recognized as a milestone in the history of popular theology. Now, in it's 70th Anniversary Year, and having sold over half a million copies, it is an iconic classic on spiritual warfare and the power of the devil. This profound and striking narrative takes the form of a series of letters from Screwtape, a devil high in the Infernal Civil Service, to his nephew Wormwood, a junior colleague engaged in his first mission on earth trying to secure the damnation of a young man who has just become a Christian. Although the young man initially looks to be a willing victim, he changes his ways and is 'lost' to the young devil. Dedicated to Lewis's friend and colleague J.R.R. Tolkien, The Screwtape Letters is a timeless classic on spiritual warfare and the invisible realities which are part of our religious experience.